We’ve been growing plants and herbs at the house for a few years now (but not as many as I wish we had in retrospect). But, as far as I could find with a cursory search, I’d never done an end of summer summary of how the growing season went for us. I know there are still somewhere between a few weeks and a couple months before first frost, but I don’t expect anything to radically change between now and then. The ones I planted were done around the beginning f the planting season – around when they started being sold at a hardware store (I honestly can’t remember if this year it was Home Depot or Lowes). The ones from my in-laws were around mid-July. We also had mint in the front yard (planted last year) and some fig trees and a persimmon tree that have been with us for around 5-6 years at this point. So, how did it go this year? Let’s start with the failures and move our way up. 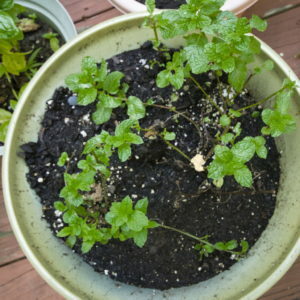 The biggest failure: the front yard mint. Once upon a time it grew so prodigiously that a groundhog thought it made a great place to hide. I was giving away mint at work so it wouldn’t go to waste. Then we had two things back to back from which it has never recovered: a power-washing of our house’s walls with some kind of “organic” soap and the need to dig up the area around it to put some rocks near the porch to stymie future groundhogs. Since then we get maybe one stalk. There are two possibilities – one is that the front yard tree has grown so large that not enough sunlight reaches the area and the other is that I need to put more nutrients into the soil. Or a combination? Or neither? I haven’t really nerded out about horticulture like I have with cooking, computers, and photography. This year I think we got 3 leaves. Pathetic. Next up were the tomatoes. Every time I talk to anyone else who grows tomatoes they always say they get more tomatoes than they know what to do. Never the case with me. Despite watering the plants twice a day, after their first time flowering, they tend to falter. Right now they barely have any leaves doing well. Over the three plants I harvested MAYBE 12 tomatoes. About somewhere in the middle is the sweet basil. Being able to go out to the garden to grab it whenever we wanted to make a red sauce or salad was the impetus to start our garden in the first place. 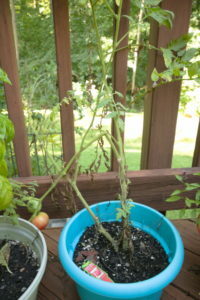 Just like the tomatoes, it seems to need lots of water. (Although when we had a straight week of rain, that seemed to be way too much water and the plants seemed to respond badly to that as well) Unlike the tomatoes we’ve had a fairly decent harvest. We never seem to get the enormous basil bushes or two-foot tall plants I always read about, but we seem to mostly have about as much basil as we need at any one time. I might prefer four plants next year and just get creative if things get a little too bountiful. Overall, this is our first successful set of plants on this list. 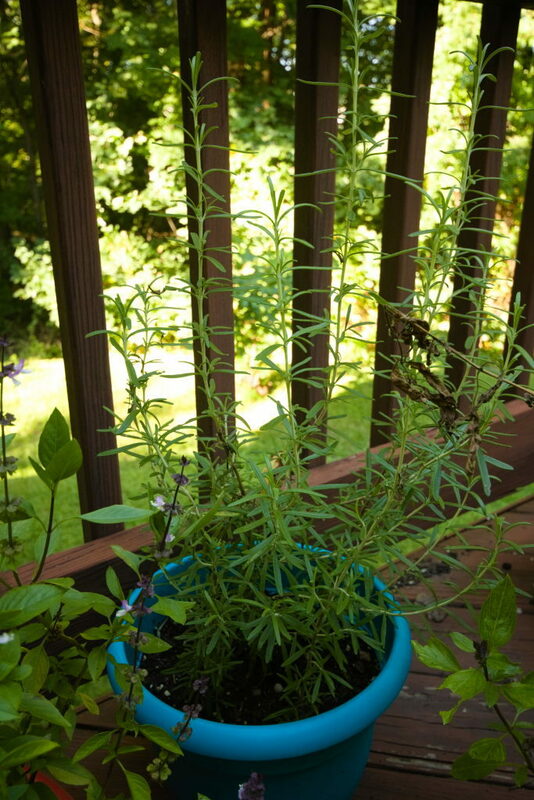 Then we have a tie between thyme and rosemary. With barely any maintenance they’ve both grown beyond my expectations. 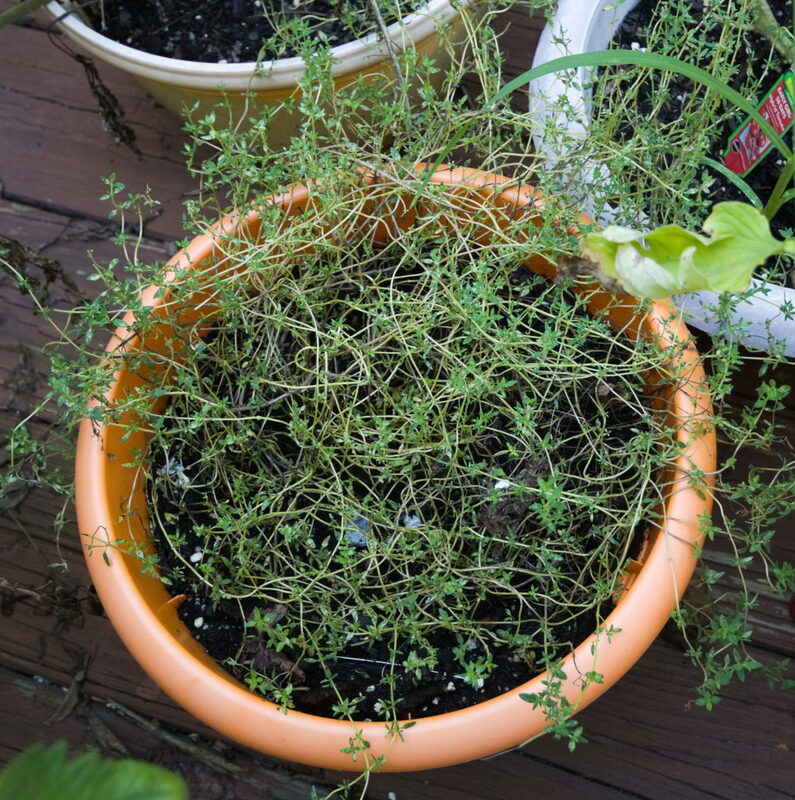 It may help that recipes for free rosemary and thyme are relatively rare. But I do like how much I get out of it without very much work at all. I may make use of it along with some of the mint for some lamb before the summer grilling season ends. (Not that the end of the season really stops me) I’d like to get one rosemary and one or two thyme plants next year. Fresh thyme just tastes so much better than dried. Another tie between the backyard mint and chilis. For having been planted so late in the year, both are giving good yields. And, I’ve already harvested some mint before when I had some summer rolls. Will definitely go for a pot or two of mint next year. 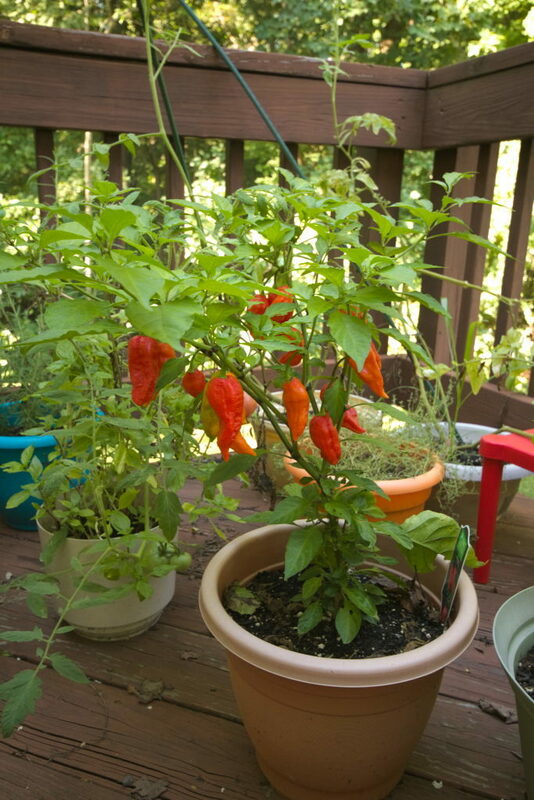 As for the chilis – my chili needs tend to be very small. A couple poblanos here and there. May a habanero for a recipe. It doesn’t make sense for me to grow any. But if my father-in-law wants to “sublet” some growing space again next year it’s no big deal. 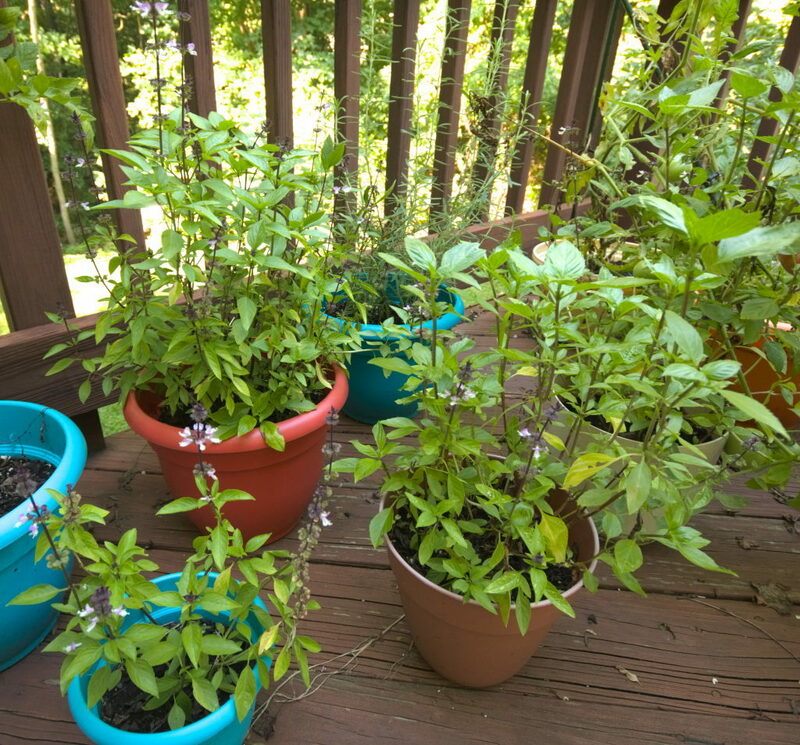 The winner of the backyard plants is also the one I’m growing for the first time this year: thai basil. 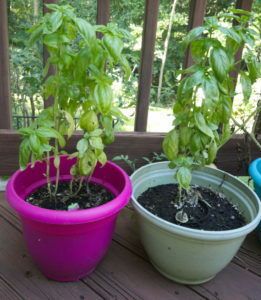 Much less fussy about water than basil and the leaves don’t get too much smaller if you let the flowers grow. It has grown so much, that my mother-in-law split some off from one of the plants and replanted it. I wanted to have some on hand because every once in a while we just up and decide to make some phở or other dish and to get thai basil we have to do a 30 minute round trip to the asian market. So I just wanted to have some outside. It’s been more than worth the time and money. As for the trees, the fig trees seemed poised to produce a lot this this year, but then we had a freak dip in temperature early in the summer that seemed to kill off a lot of the flowers. It’s been a relatively low yield year for the figs. By contrast, the persimmon tree is producing so many that some are falling to the ground to decay. I’d also like to do some research and see if I can figure out why the mint isn’t growing in the front garden. Also, and this is quite possibly not going to happen this year, I’d like to toy around with building a gadget to measure soil moisture and see if that can help with the more finicky plants.